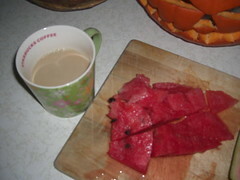 I had coffee and watermelon for breakfast today. James says I eat like a five year old, but only an adult (me) without other adult supervision (James) eats a breakfast like that. hmm haha u got me at the spaghetti part! uhm i love watermelon! We have good types of sweet watermelon around here. I see you like your coffee the same way I do. Lots of cream. I've been into the hazelnut coffeemate lately. Watermelon is good - and good for you too. Yum yum. Enjoy. Even better than using lots of cream, I've been brewing my coffee with added cinnamon. YUMMY!!! And it smells delicious, too.